Do you remember what it was like to be a child? To see the world with wide-eyed wonder? Belief is at the heart of our most profound experiences – it is what allows us to dream and imagine, to picture the possibilities. Royal de Luxe uses theatrical magic to rekindle that belief, to make us young again. Over three memorable days in February, we will be immersed in a modern-day fable, played out by the Giants across the streets of Perth. This is our story, our people, our culture and our country. 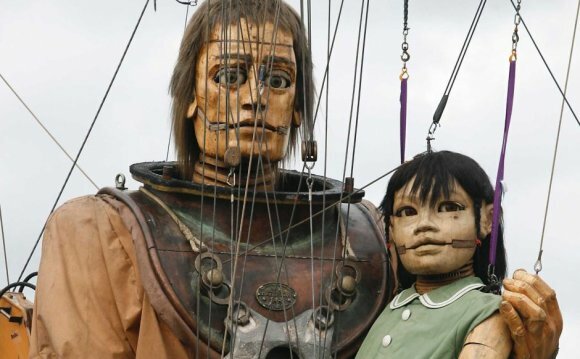 The Incredible and Phenomenal Journey of The Giants to the Streets of Perth takes inspiration from uniquely Western Australian stories – of ancient lands, Gallipoli-bound troops and a little girl in a lighthouse who buoyed their spirits. This is our chance to ensure a new generation of Western Australians comes to hold dear that which has shaped us. Once we have walked with the Giants, our city will never look the same again. There are certain moments in history that etch themselves on our minds, momentous occasions we remember long after the fanfare has faded – The Incredible and Phenomenal Journey of The Giants to the Streets of Perth will be one of those moments. Put aside the day-to-day, surround yourself with those you know and love, and be part of a truly transforming commemoration of the centenary of Anzac. This is an experience to be shared and remembered. The Giants is a three-day event with surprises each day. The story begins on Friday 13 February and as the Giants walk our streets, they will become part of the city and include us all in the spectacle. On Saturday, the story – and the theatre – continues, until Sunday when we come together for the finale. This is an epic event – no two days are the same and you are invited to come back again and again. To ensure you don’t miss a minute, be in Perth on 13, 14 and 15 February. The Giants are sure to attract large crowds and we want you to make the most of your experience. You will find details on the Giants’ routes, as well as times, road closures, vantage points, accessible areas, transport and parking here. You will also find out how to get involved through Anzac Profiles and Postcards from Home.